Ships of the Biwako Kisen Steamship Co.,Ltd. (琵琶湖汽船), a company that organizes cruises and ferries on Lake Biwa in Shiga Prefecture. The company was founded in 1869 (Meiji 2) and is still in business today. The ship at the back on this photo is the Hakucho Maru (白鳥丸, Swan). 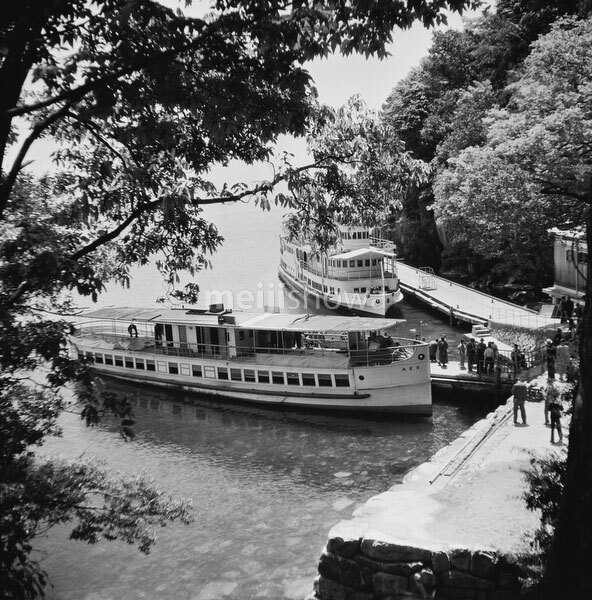 It was completed as the Momotaro Maru ( 桃太郎丸) in March 1927 (Showa 2), but renamed in February 1930 (Showa 5). The Hakucho sank twice: during the Typhoon Muroto (室戸台風) of September 1934 (Showa 9), and during a storm in September, 1945 (Showa 20). Both times the ship was salvaged. The Hakucho Maru was scrapped in December 1963 (Showa 38).